What greater indictment of a system could there be than an epidemic of mental illness? Yet plagues of anxiety, stress, depression, social phobia, eating disorders, self-harm and loneliness now strike people down all over the world. The latest, catastrophic figures for children’s mental health in England reflect a global crisis. There are plenty of secondary reasons for this distress, but it seems to me that the underlying cause is everywhere the same: human beings, the ultrasocial mammals, whose brains are wired to respond to other people, are being peeled apart. Economic and technological change play a major role, but so does ideology. Though our wellbeing is inextricably linked to the lives of others, everywhere we are told that we will prosper through competitive self-interest and extreme individualism. Neoliberalism is creating loneliness. 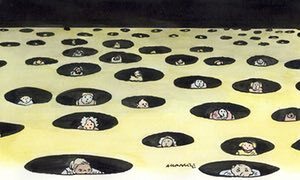 That’s what’s wrenching society apart | George Monbiot | Opinion | The Guardian.